See the way through the complex of Vat Phou in pictures. The temple complex is located at the foot of Phu Kao, overlooking the floodplain of the Mekong River. The shrine itself is built on a natural terrace of Phu Kao where a freshwater spring gushes out of the rock, just below 200 m asl, but the temple complex as a whole is laid out on a linear plan stretching out for 1400 m along an east - west axis, rising up the lower slopes of the mountain from the plain below. The whole was designed to be approached from the east and to impress the worshipper with the sanctity of the place. This linear axial layout is rare for a pre-Angkorian or Angkorian temple and clearly reflects the conscious use of the natural terrain and the focus of the Lingaparvata to their maximum effect. At the lowest level, oriented east-west, there is a large baray, some 200 m by 600 m, probably built around the 10th to 11th century AD. It is flanked on its western side by an elaborate stone embankment, to the north are two further large baray constructed by building up earth dykes and not by digging down into the ground. One of those barays, immediately to the north of the first baray was built around the end of 11th and the beginning of 12th century AD. From the first terrace, by the stone embankment, runs the processional causeway, flanked by typical stone pyranidae pillars, used to embellish the ceremonial road. The temple complex was built on six terraces. The first terrace is over 130 m deep from east to west. The front third is occupied by two large, rectangular stone buildings flanking an esplanade, 44 m wide. Each building is quadrangle of four galleries around a wide courtyard, with overall dimensions of 62 m by 42 m. Facing each other and parallel to the general axis, the main gallery of each quadrangle opens onto the esplanade through a projecting porch, with very elaborately carved doorways, and is connected to the other three galleries by doors located at its extremities. These buildings have been identified in the past as "palaces". However, the present research suggests that they might have been used for ceremonial purposes, praying for good fortune, and hosting a number of monks during the ceremonial period. Judging from the stylistic aspects of architecture - the style of Koh Ker - , is is dated the beginning of 11th century AD. The western part of the first terrace is an open space rising sligthly towards the foot of the second terrace. On the main axis, a walkway is bordered by regularly spaced milestones, and by the foundations of former galleries which were covered by a wooden-and-tiled roof on stone pillars. To the south is a small, isolated, rectangular building in sandstone, with pillared porches at its north and south sides, traditionally called the Nandi Hall, dated to the mid-11th century AD. Field work in 1998 has shown a building of similar size symmetrically placed to the north of the axial path, never completed. Raised about 2m above the first one by a retaining wall, the second terrace forms a landing on the main axis. This was flanked by two small structures which sheltered two Dvarapala (guard of temple). One of these is still standing. Both are therefore dated to the 13th century AD. The headless stone sculptures of two tall guardians are lying on the grass, together with other fragments. A flight of stairs between retaining walls gives access to the third terrace, forming the next landing between two small stone pavilions (the north one mostly built with re-uesed blocks). On the main axis, a 75 m long ramp raises gradually by 15m, slightly elevated above the open space on both sides which follows the natural slope. The fourth terrace, approximately 20 m wide, is retained by a higher wall. The original stairway to it, composed of 3 flights between lateral stone banks, is now encased by a later one made of re-used stones. There are 6 small brick towers, three on each side of the axial path. Those towers are aligned on a common, north-south axis. A linga was placed in each tower. The style of linga, together stylistic aspects of the towers, indicate that the towers were built around the 11th century AD. The fifth terrace is also about 20 m wide but divided into two parts by a flight of stone steps, and slightly raised above the fourth one. A stone-paved landing with Naga-balustrades marks the main axis. From this level starts e series of seven tiers of retaining walls, with a total height of 15 m. They are axially intersected by seven flights of stairs, of eleven steps each, separated by narrow landings. The stiars end at a sixth and last terrace located about 75 m above the barays and commanding and impressive view over the whole complex and over the plain to the Mekong and beyond. The terrace is a rough square of 60 x 60 m, with the main Sanctuary (shrine) dedicated to Shiva, at its centre. Behind it, at the foot of a overhanging cliff which dramatically closes the whole sequence, is the spring which accounts for the sanctity of this precise site. The stream has been channeled so that it flowed through the main sanctuary of the temple itself and over the central representation of Shiva which originally would have been in the sculpted form of a Shiva lingam. Therefore, the linga was always kept wet by the holy water coming from the spring. To the south of the central shrine is a small ruined building, commonly known as the "library". The western side of the terrace, below the overhanging cliff, was formerly closed by a galleried portico, of which some remains survive. On the north side, this terrace is extended by natural shelf of the mountain, on which stands a small modern monastery and, farther, several rock carvings and ancient stone structure, roughly dated to the 7th century AD. partly crushed at an unknown date by the fall of huge rocks from the cliff above. Recent study of the brick part of the present shrine indicate, that it is probably dated around the 10th - 11th century AD. However, it is itself of two periods, with the brick rectangular tower at the back being the earliest. It is now fronted by a later (11th century AD) antechamber or mandapa. The quality of the carving of this building is very fine. The style of architecture shows that it may be classified "Baphuan Style" which is typically 11th century. The whole complex developed over a long period. The earliest remains found are of the seventh century AD, as noted above, but much of what can now be seen is much later. 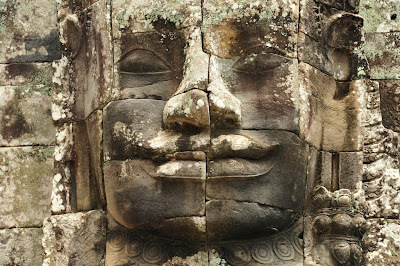 There was a major rebuilding in the eleventh/twelfth centuries and the site was maintained by the rulers of Angkor down to the fourteenth century. It was converted from Hinduism to Buddhism in the thirteenth century AD and retains a local religious function down to the present day.